A formal notice filed with the Court and served on the defendant, ending active litigation. Simply, to abandon a claim that is in-progress. 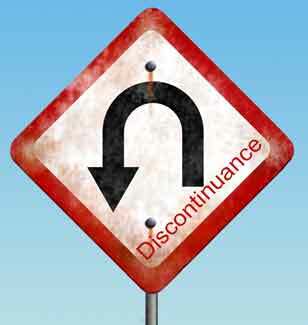 Only a plaintiff can file a discontinuance and he or she can do so over the objection of the defendant. "The plaintiff is the master of this litigation, and may proceed or not as he chooses. He is therefore entitled to the order he seeks. If the defendant has some claim against him, her remedy is not in this action, which is now at an end." "At any time before an action is set down for trial, a plaintiff may discontinue it in whole or in part against a defendant by filing and delivering a notice of discontinuance ... to each party of record. After an action has been set down for trial, a plaintiff may discontinue it in whole or in part against a defendant with the consent of all parties of record or by leave of the court. ... a person wholly discontinuing an action ... shall pay the costs of that party to the date of delivery of the notice of discontinuance...."
"The discontinuance of all or part of an action is not a defence to a subsequent action, unless the order giving leave to discontinue or a consent filed by the parties provides otherwise." "(Where discontinued) ... the action is not dead for all purposes, but that the Court can make such order as justice requires notwithstanding the discontinuance." "... in appropriate circumstances where the interests of justice require, the Court has inherent jurisdiction to set aside a notice of discontinuance." "By obtaining leave to discontinue he (the plaintiff) is at liberty to litigate all matters in question over again.... By reason of the discontinuance there is no success or defeat on any of the issues." Halsbury's Laws of England, 4th Ed., Volume 38, "Practice and Procedure" (London: Butterworths LexisNexis, 2001), page 233-243 (note 1). Stevenson, W. and Côté, J., Civil Procedure Encyclopedia, Volume 2, Chapter 30 "Discontinuance" (Edmonton: Jurileber, 2003).